Photosynthesis takes place in two steps: Light reaction and Dark reaction. Light reaction occurs in the grana of chloroplast. The chlorophyll absorbs the light energy. Hence the chlorophyll is called a photosystem or pigment system. Chlorophylls are of different types and they absorb different wavelengths of light. Accordingly chlorophylls exist two photosystems, namely photosystem I (PS I) and photosystem II (PS II). Both photosystem (PS I and PS II) are affected by light with wavelengths shorter than 680nm (nanometer), while photosystem I is affected by light with wavelengths longer than 680nm. Photosystem I includes the following pigments: Chlorophyll b, Chlorophyll -a 670, Chlorophyll -a 680, Chlorophyll -a 695, Chlorophyll -a 700 or P700, Carotenoids. In photosystem I, P700 form of chlorophyll a is the active reaction centre. Photosystem II includes the following pigments: Chlorophyll b, Chlorophyll - a 660, Chlorophyll -a 670, Chlorophyll -a 680 or P680, Chlorophyll -a 695, Chlorophyll - a 700 or P700, Phycobilins, Xanthophylls. In photosystem II, P680 form of chlorophyll a is the active reaction centre. PS I is located at the outer surface of the grana thylakoid membrane (non appressed granal regions and stroma lamella). PS II is located at the inner surface of the grana thylakoid membrane (appressed granal region). The photocentre or reaction centre is P700. The core of PSII is a multi-subunit complex composed of about ~25-30 subunits. Pigments absorb longer wavelengths of light (>680nm). Pigments absorb shorter wavelengths of light (<680nm). Participates in cyclic as well as non cyclic photophosphorylation. Participates only in non-cyclic photophosphorylation. It is not associated with photolysis of water. It is associated with photolysis of water. Main function is ATP synthesis in cyclic photophosphosphorylation and NADPH synthesis in non-cyclic photosynthesis. Main functions are ATP synthesis and hydrolysis of water. Reference: Caffarri, S., Tibiletti, T., C Jennings, R., & Santabarbara, S. (2014). 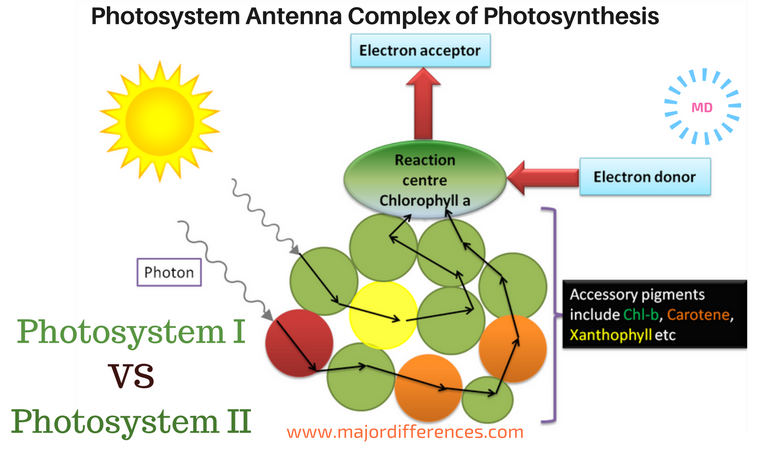 A comparison between plant photosystem I and photosystem II architecture and functioning. Current Protein and Peptide Science, 15(4), 296-331. Thankz diz is really helpfull..
Main function of PSI is to produce NADPH contrary to PSII which produces ATP ? Is ps1 involved in photolysis of water? ?,I learned its the main function of ps2. where did you got the picture from? THANX A LOT..REALLY HELPED A LOT!! !